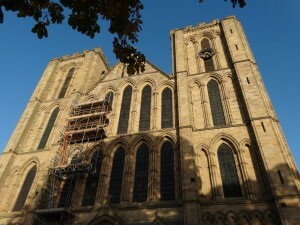 Ripon Cathedral. 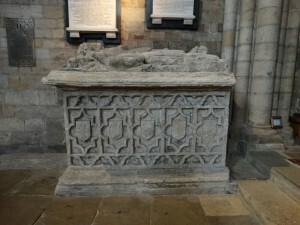 SE314712 – website. 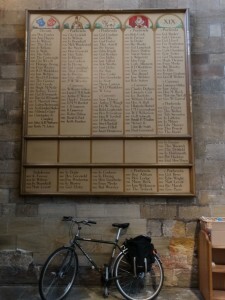 I have 138 photos – do you remember those days when we went on holiday with one 24 exposure film? 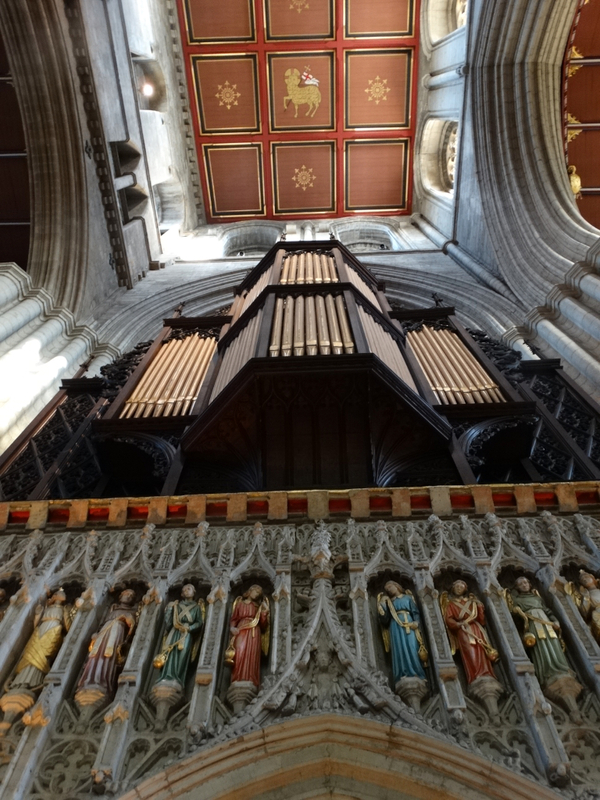 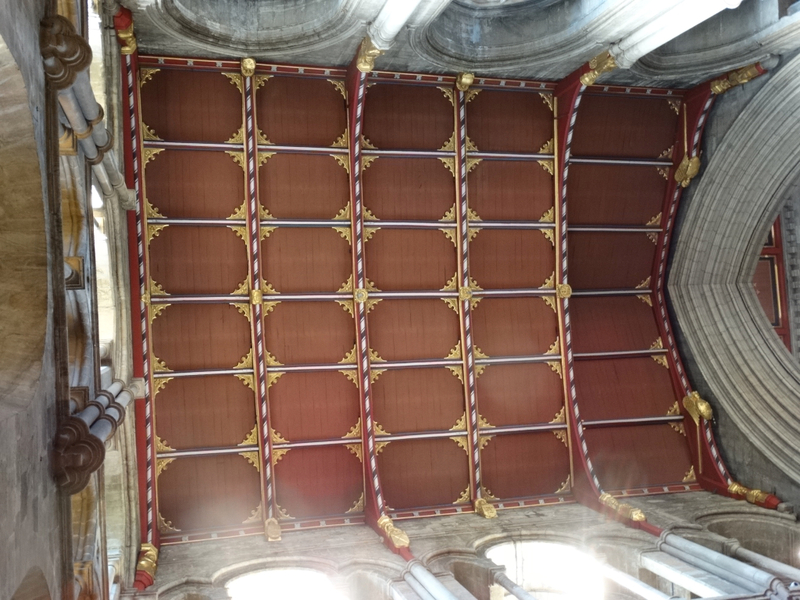 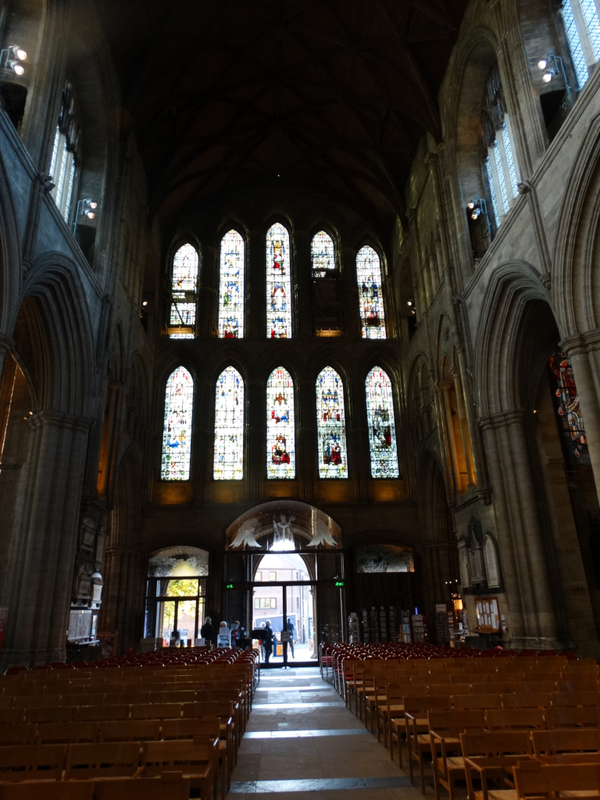 Here are a selection of them – it is a lovely Cathedral, and we had a marvellous afternoon there. The Cathedral was founded by St Wilfrid (c 634-709). 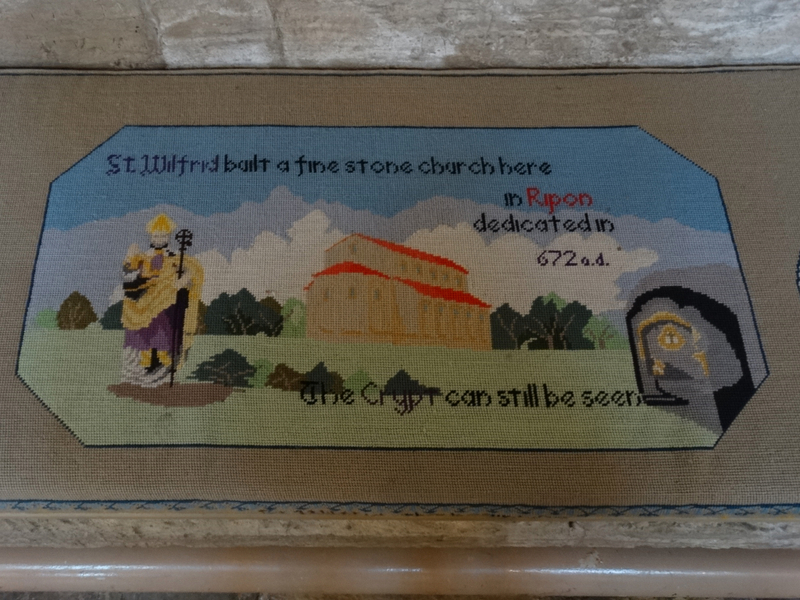 He bought craftsmen from Europe to build a new stone church on this site, dedicated to St Peter. 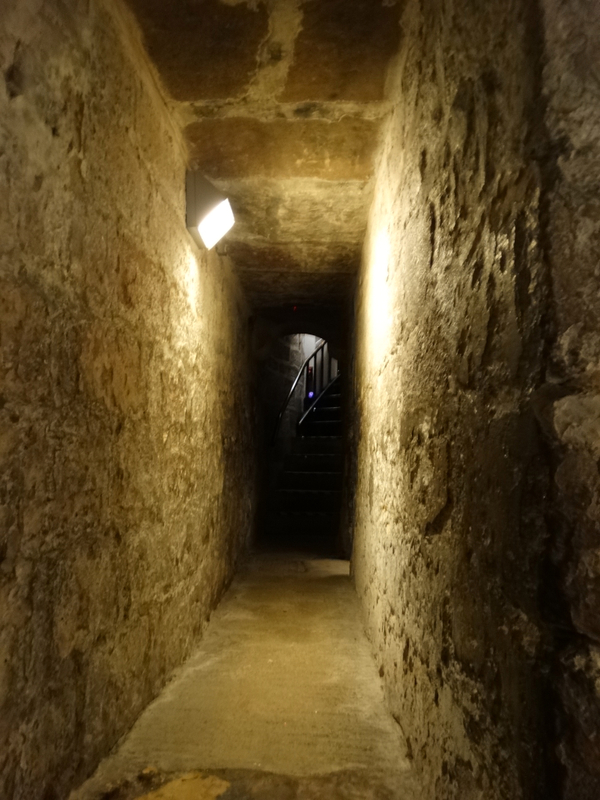 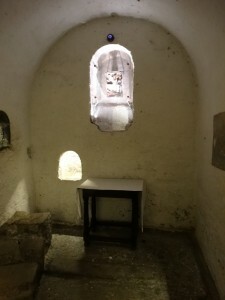 We will visit the Saxon crypt shortly. 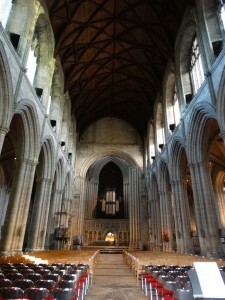 The transepts date from late 1100s, with a mixture of rounded Norman arches and later pointed gothic arches. 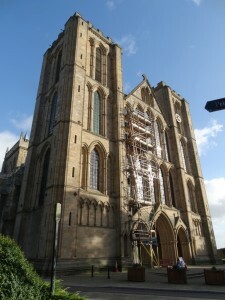 The West Front, 1220s, is a splendid example of Early English Gothic style. After the central tower collapsed in 1450, much of the Nave was rebuilt in the Perpendicular style and the side aisles were added. 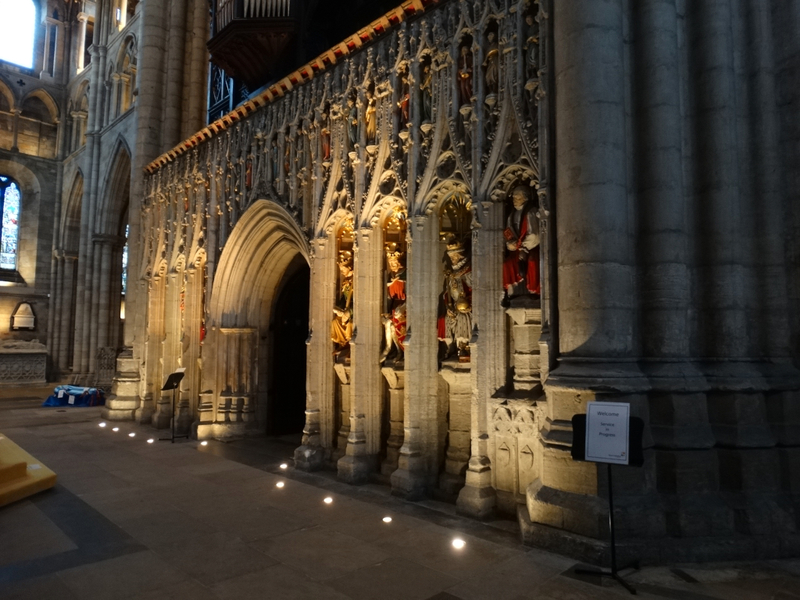 Work stopped in 1540 during the upheaval of the Protestant Reformation – please note the unfinished pillars and mismatched arches. 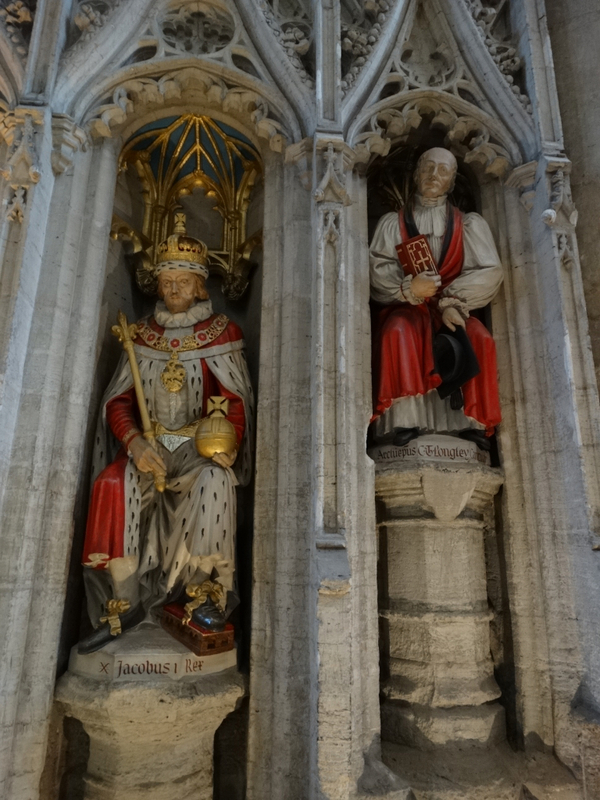 In 1604 King James I refounded the Church with a Dean and Chapter. 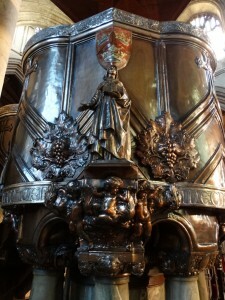 It was dissolved again under Oliver Cromwell, and reinstated in 1660. 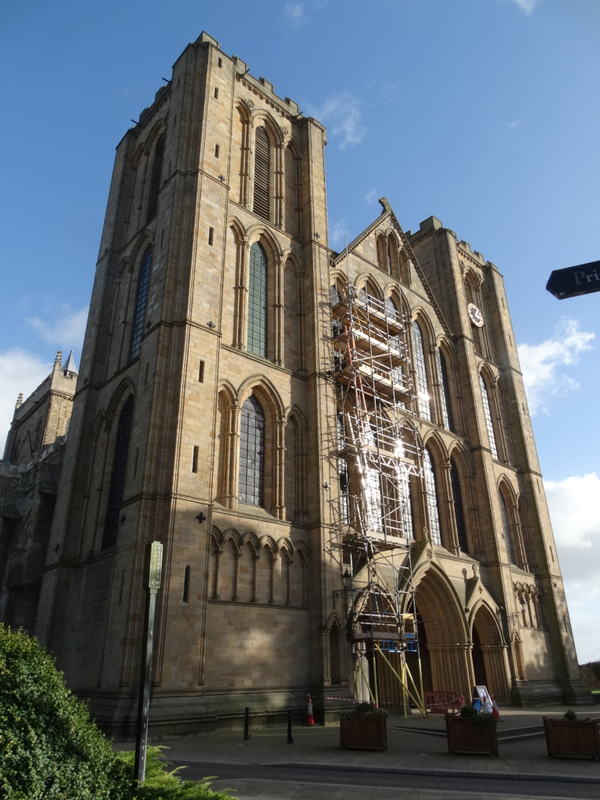 In 1836 it became a Cathedral with the creation of the first new Diocese in England since the Reformation. 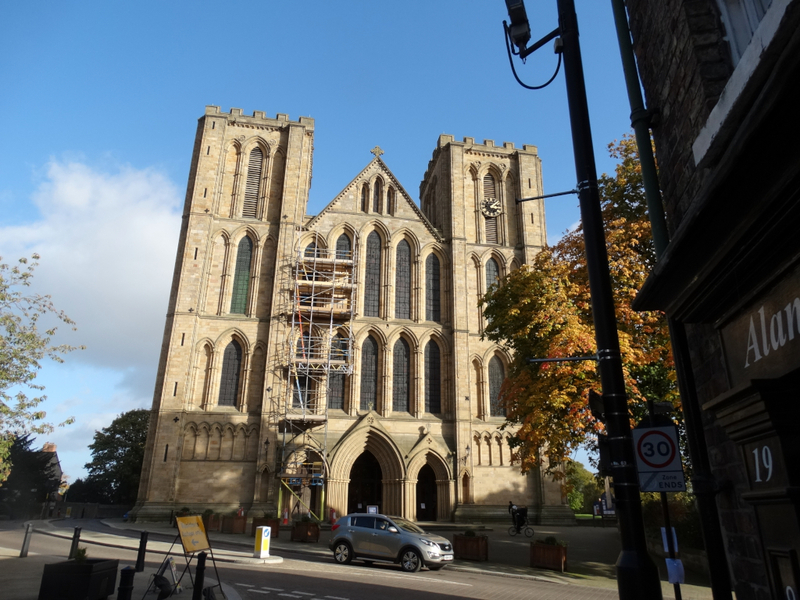 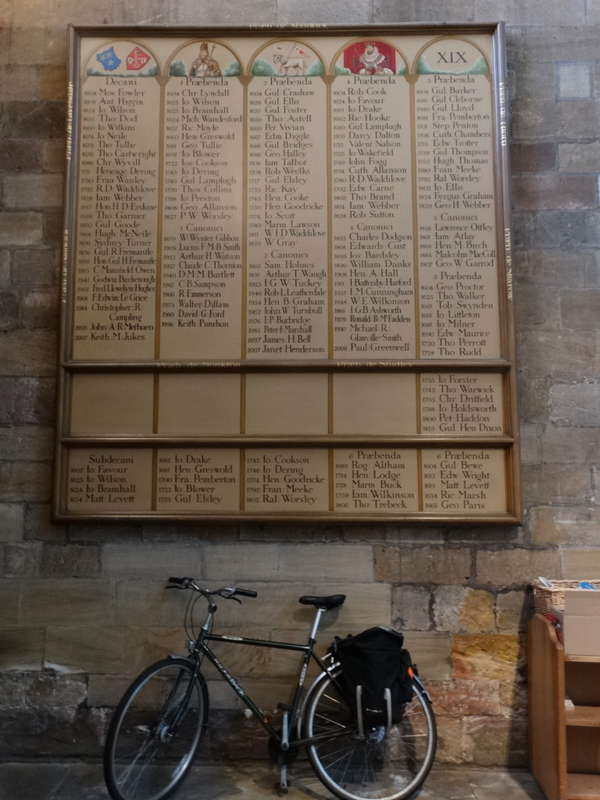 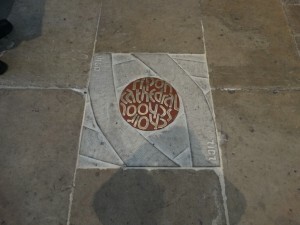 Now it has been subsumed into the Diocese of West Yorkshire and the Dales (one of three Cathedrals – the other two are Wakefield and Bradford). We had a nice welcome as we arrived, and worked our way round. 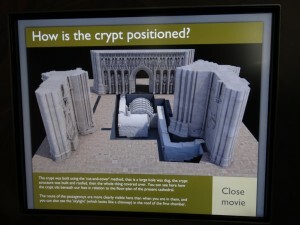 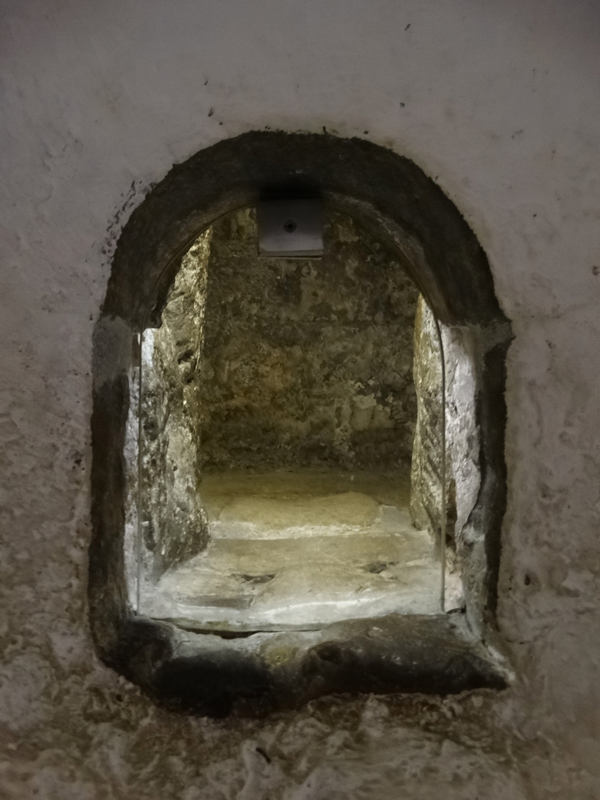 However let us start with the Saxon crypt. 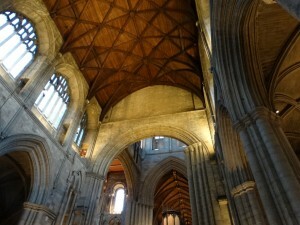 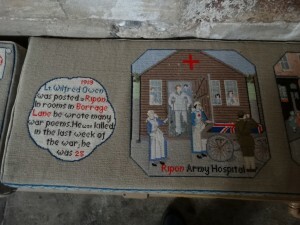 Gareth, who was Verger at Hexham Abbey and custodian of their Saxon crypt, wanted to visit this one – we never managed it. It is not as atmospheric as Hexham – the whitewash doesn’t help. 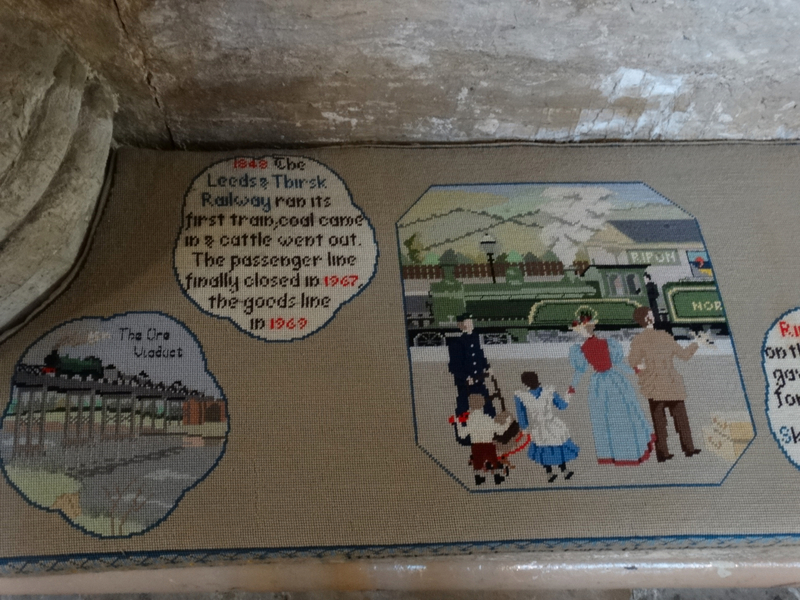 There is a good piece of explanatory AV for those in wheelchairs who can’t get down the steps. 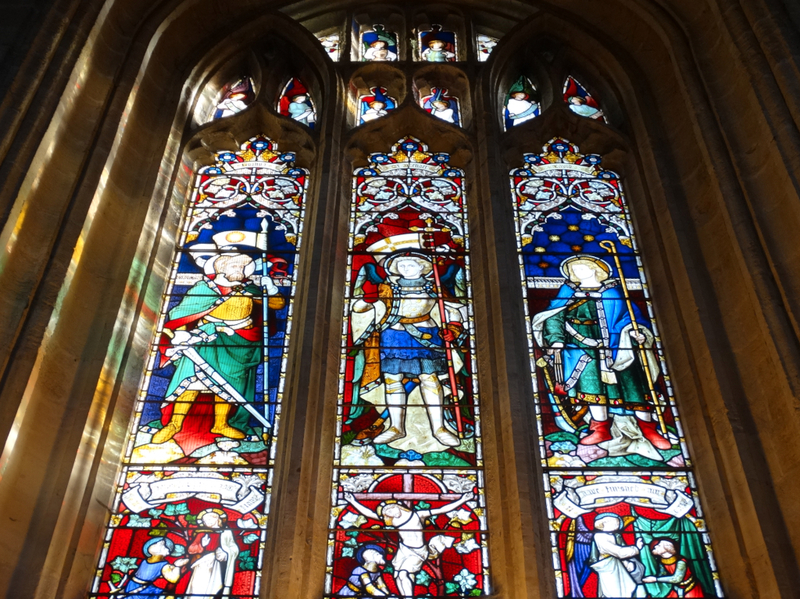 The Great West Window raises questions about life and destiny. 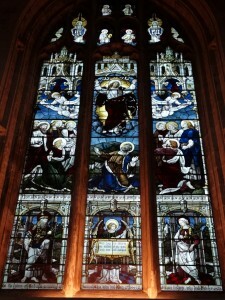 The lower five windows illustrate Jesus’ parable of the Wise and Foolish Virgins. 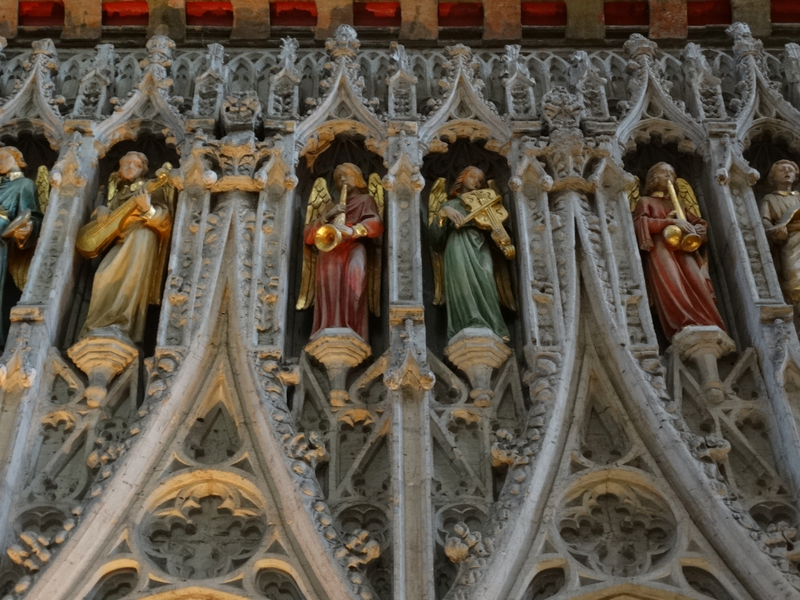 The story I like is of the preacher who ends his sermon “Brothers, will you stay awake with the wise virgins, or sleep with the foolish ones?” The top five have a Victorian version of a medieval doom painting. It was made by Burlison and Grylls in 1886. 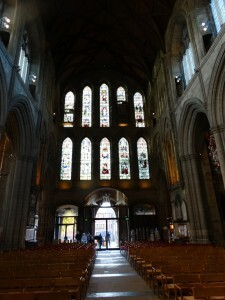 The glass doors underneath were a gift to the Cathedral in 2012. 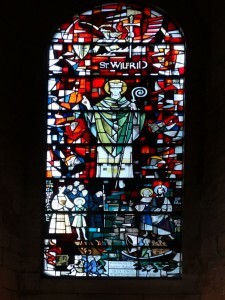 This panel shows Wilfrid with angels on either side. 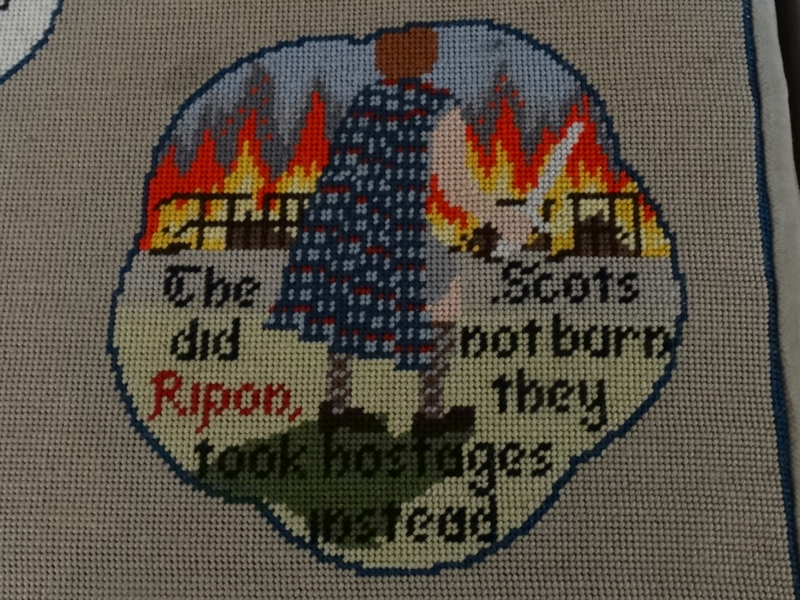 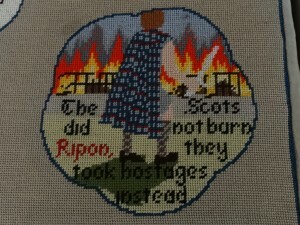 It was made by Sally Scott, 2012 – her website. 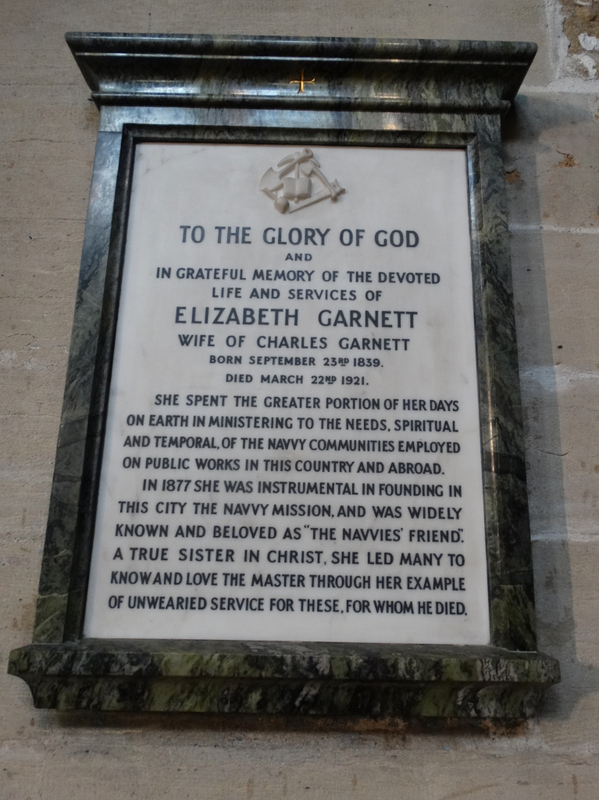 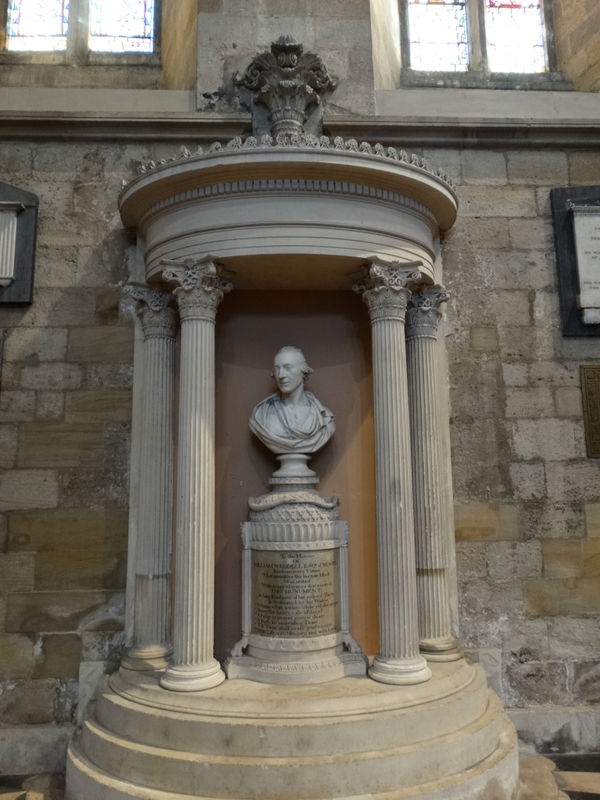 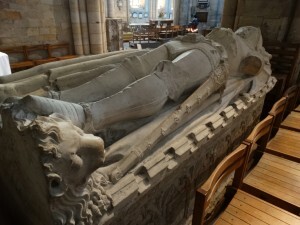 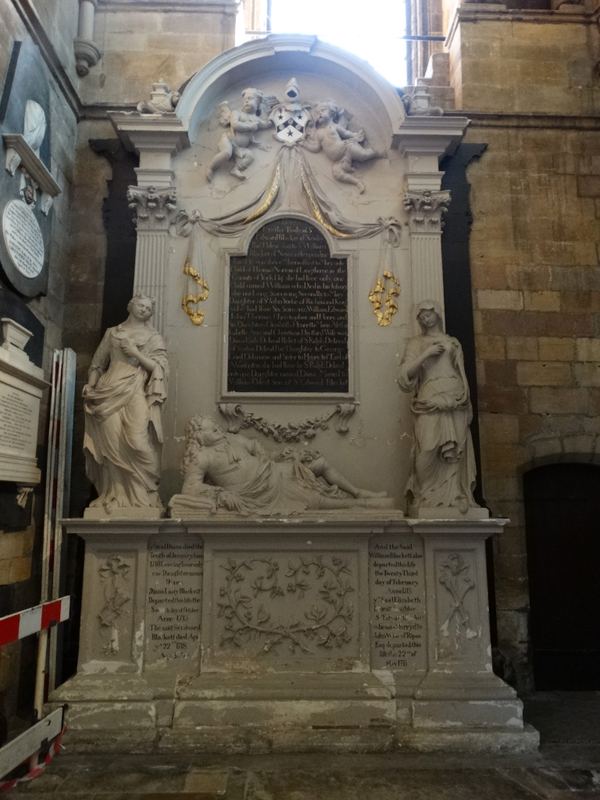 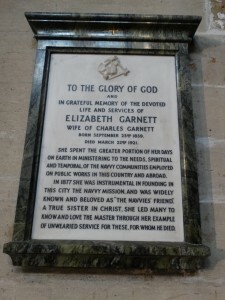 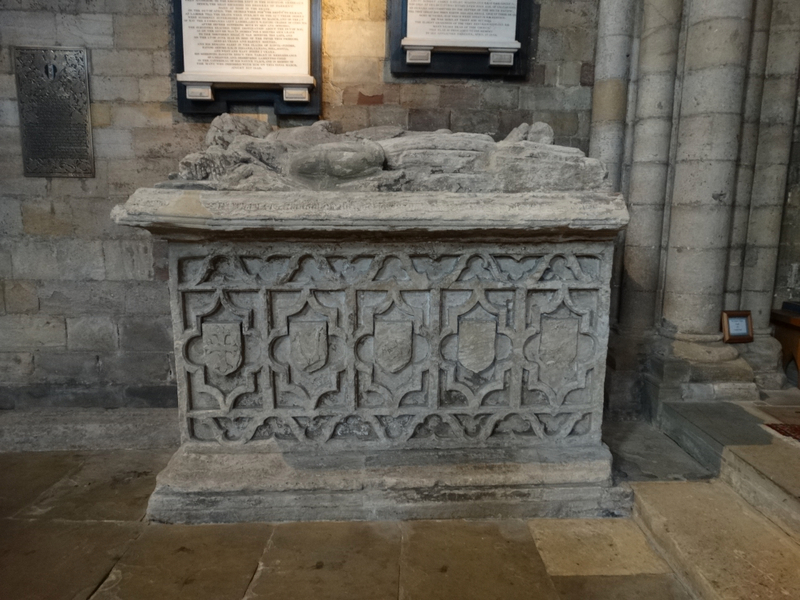 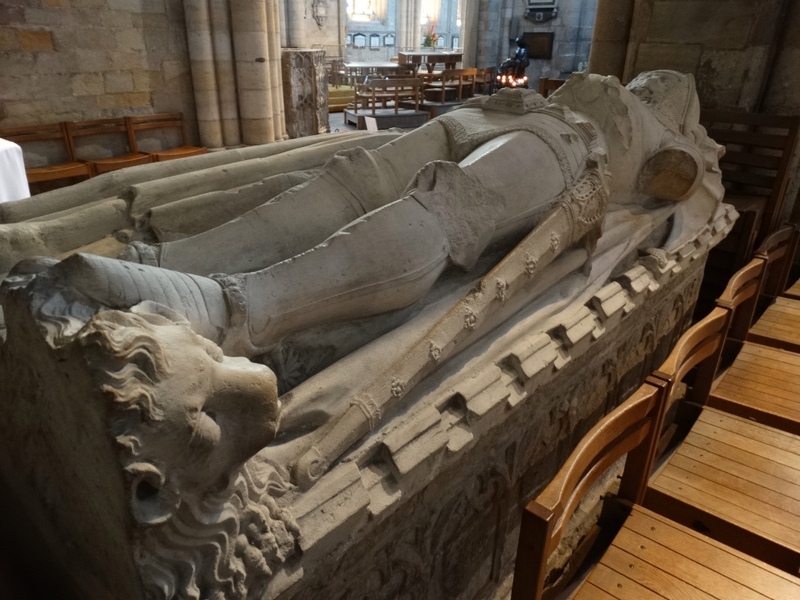 Here are some impressive tombs, and a lovely list of clergy, in the SW corner. The South Transept has a rather nice roof, and these memorials. The choir school closed only recently – now they take youngsters from several different schools. 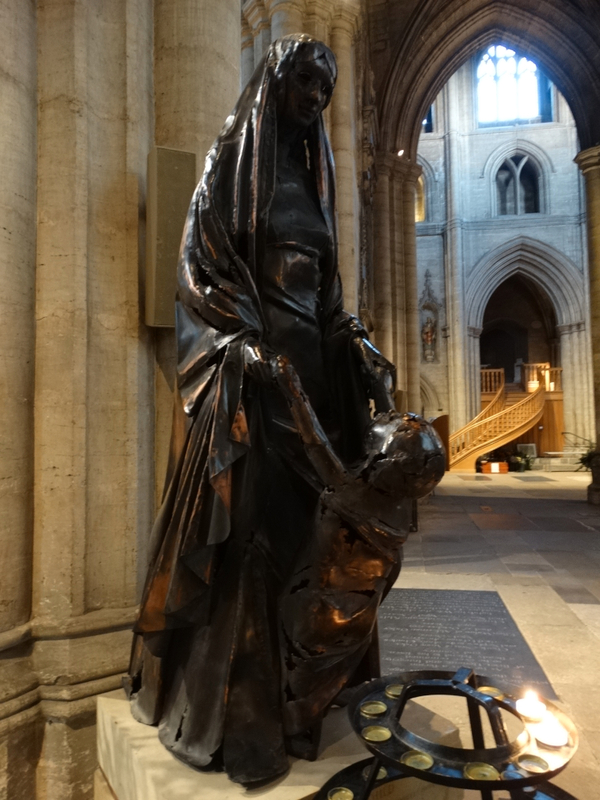 This is a statue of the Madonna and Child by Yorkshire artist Harold Gosney. I liked this Nativity scene in one of the windows. 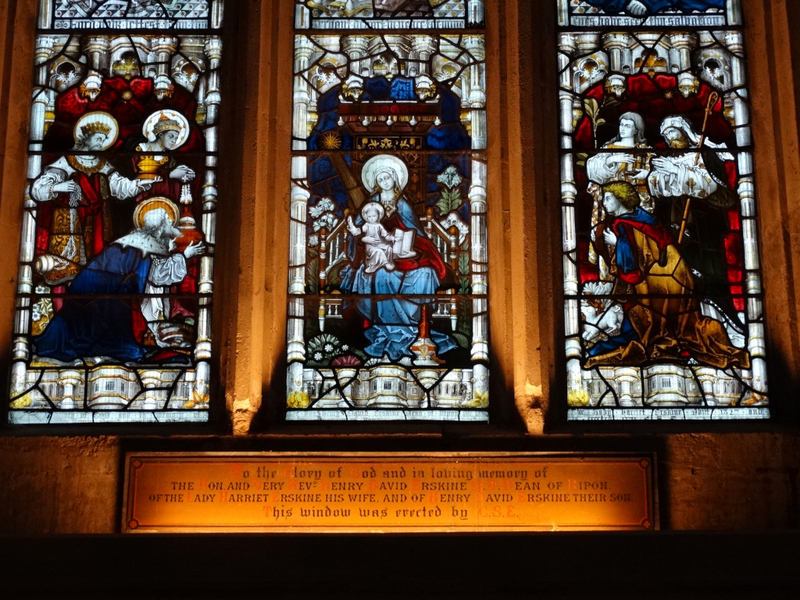 This is Joshua, Michael and David in a window, maker unknown, 1866, in memory of Captain William Slayter Smith who fought at the Battle of Waterloo. 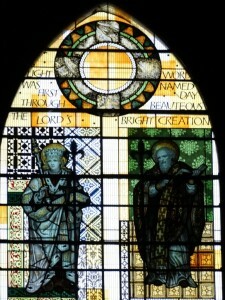 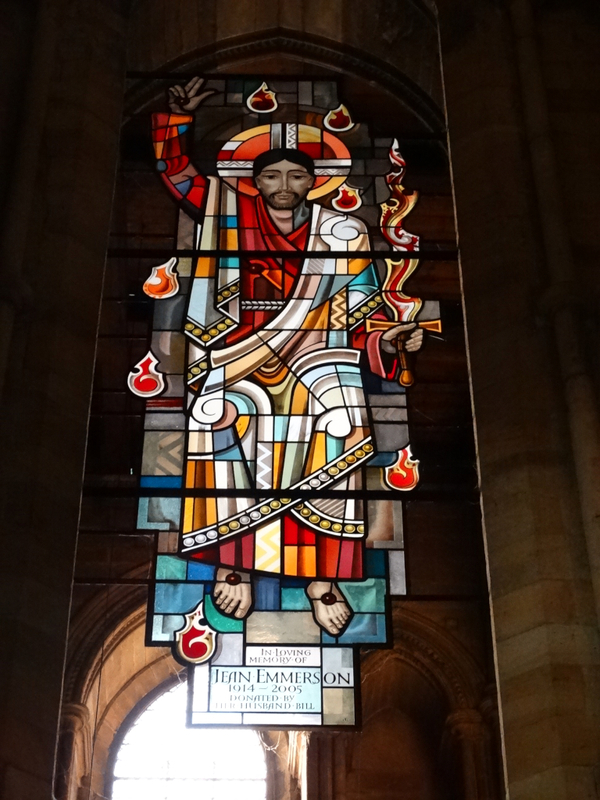 The is the Ripon Teacher Training College Chapel Window, by C.E. 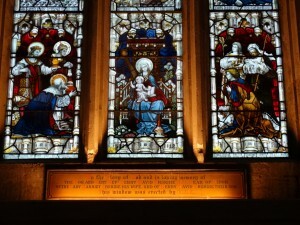 Kempe, 1902-5, moved here and conserved by Bridget Jones in 2005. 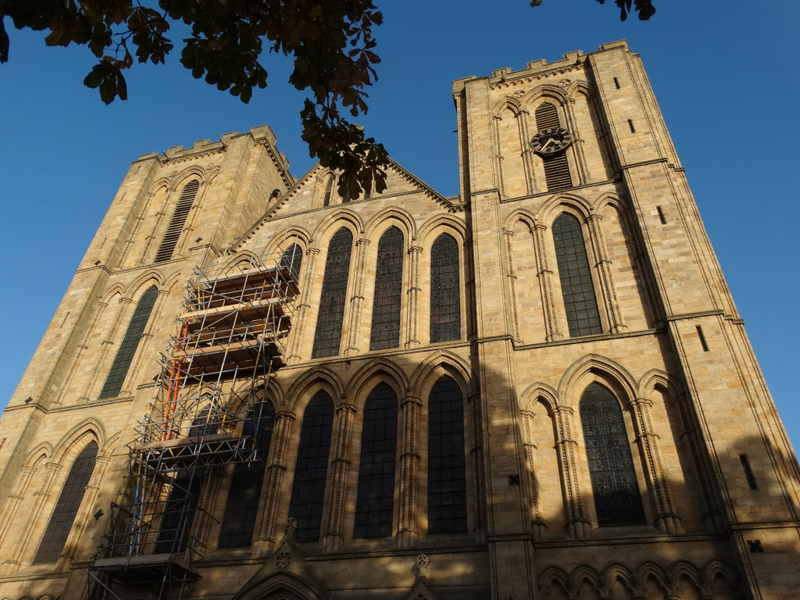 At the top is the Ripon Jewel, based on the small Saxon roundel which can be seen in the Treasury (a place we didn’t get to). 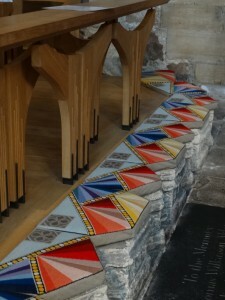 The Stone Pulpitum, which divides the Nave from the Chancel, dates from 1480. 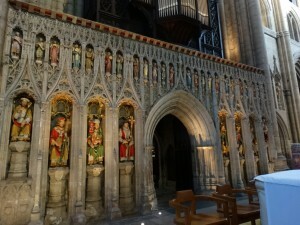 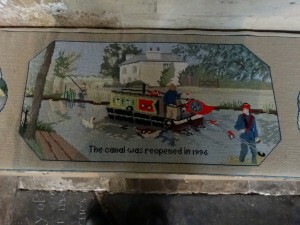 Theae figures were installed in 1947 and painted in 1958. 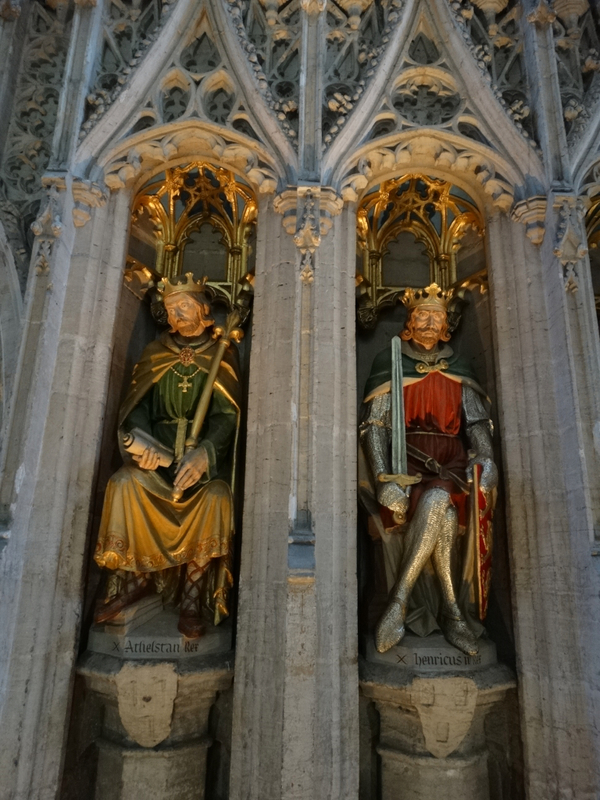 They are rather lovely. 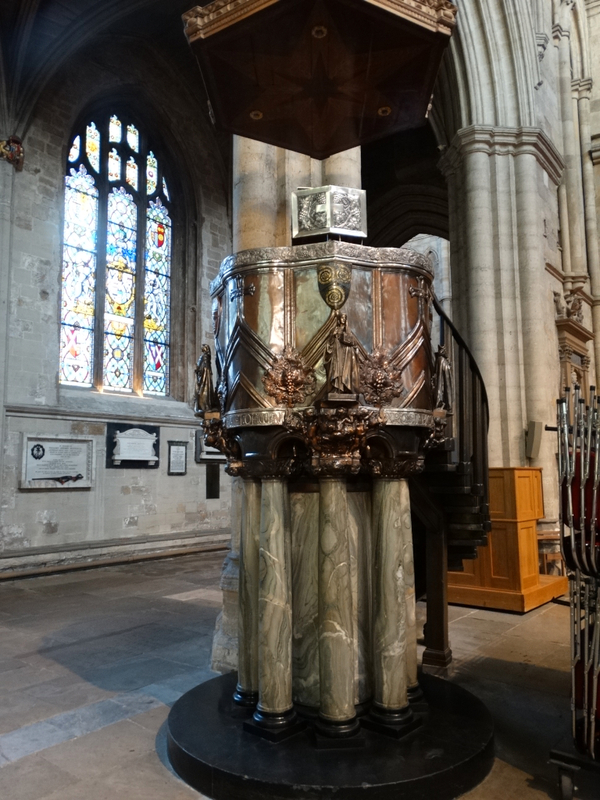 The pulpit was made by Henry Wilson in 1913 and shows both Arts and Crafts and Art Nouveau influences. 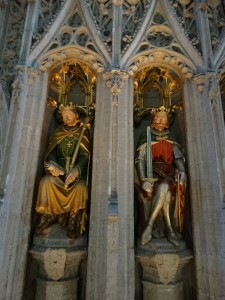 Various Anglo-Saxon saints are depicted. 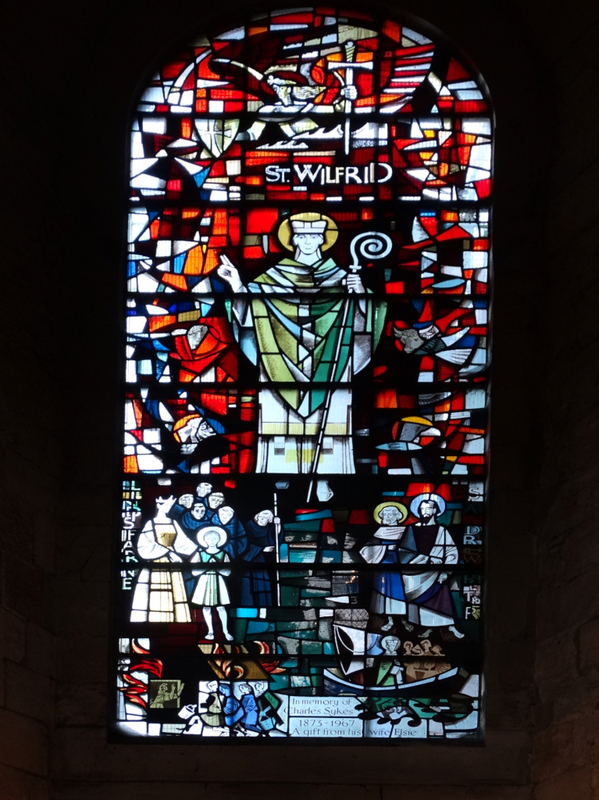 In the North Transept we have this chapel with a modern memorial window to St Wilfrid. 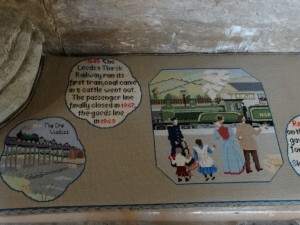 It was made by Harry Harvey in 1977. 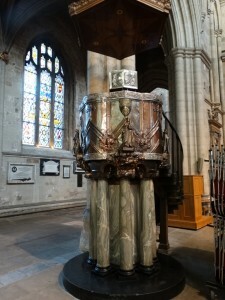 You can see the symbols of the four evangelists, Wilfrid being sent by Queen Eanfled to study at Lindisfarne, the symbols of SS Andrew and Peter (Wilfrid dedicated churches to them both), and, at the bottom, Wilfrid’s birth and the story that he alleviated an acute famine by teaching the people of Sussex to fish. 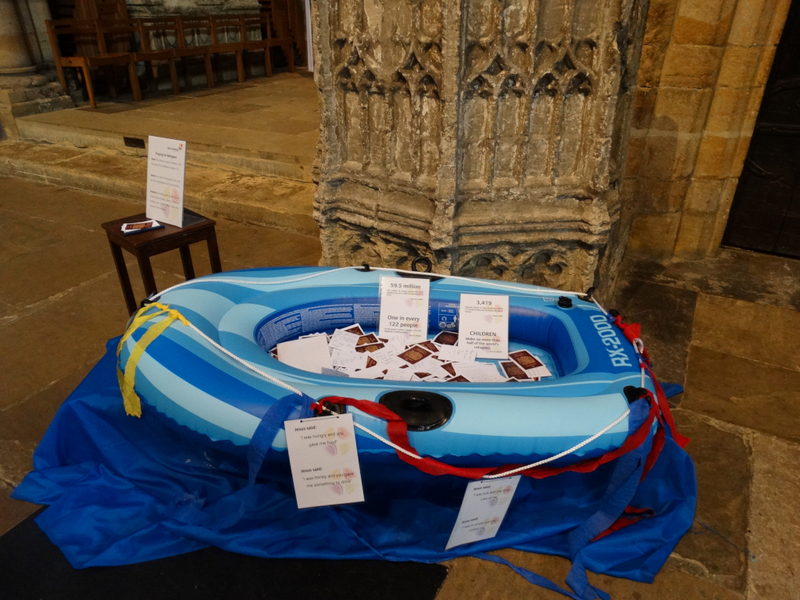 The current-day Cathedral community are also calling us to pray for those fleeing Syria and other war zones, and taking to the sea in small boats. 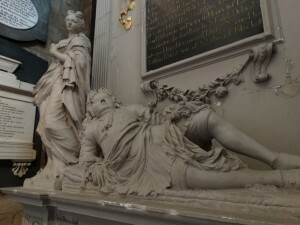 There are interesting memorials as well. 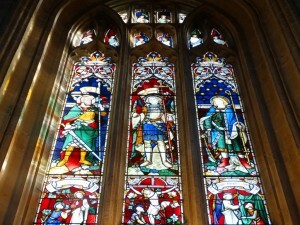 Here are some more windows. 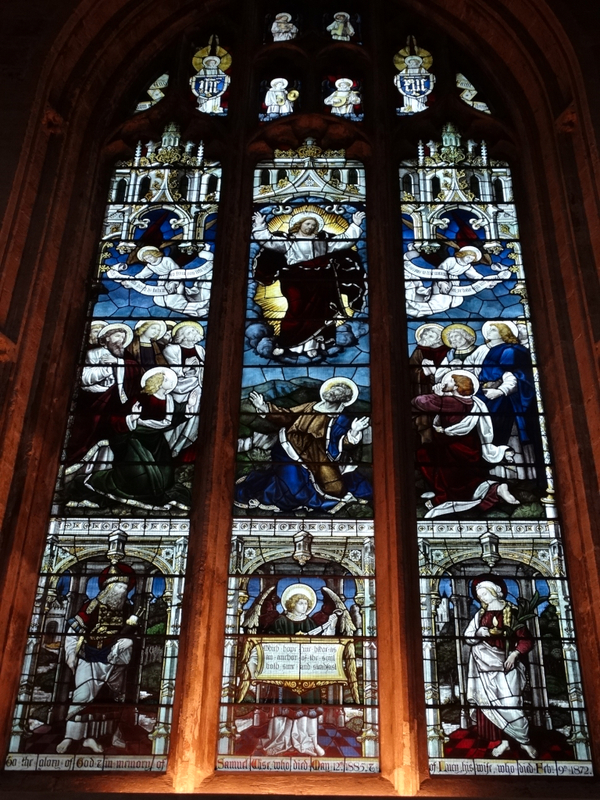 This one is the Grantley window by Thomas Willement, 1840. 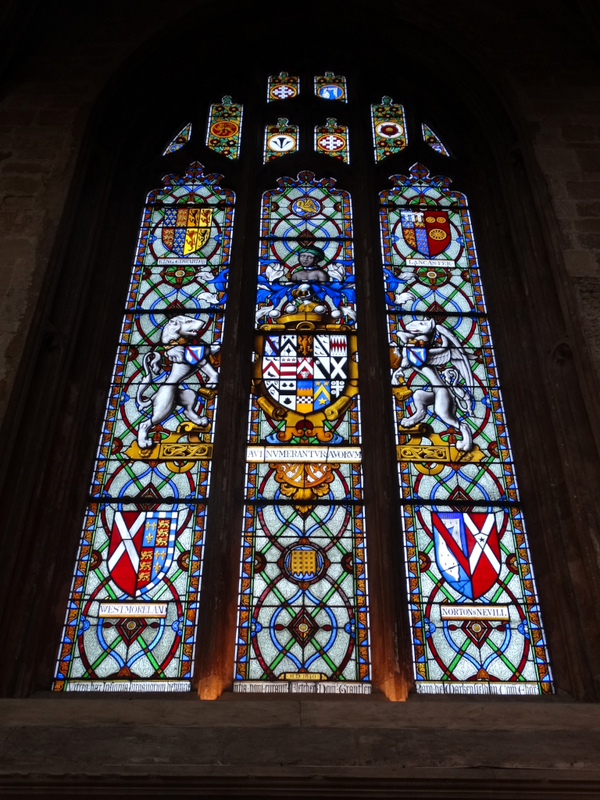 It is memory of Fletcher Norton, 3rd Lord Grantley and proclaims the ancient lineage of his family. 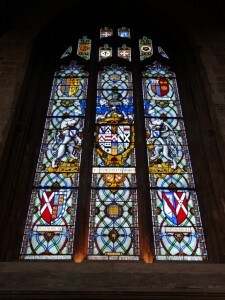 We have coats of arms of Edward III, John of Gaunt, Sir William de Washington, and even a Moor’s head. 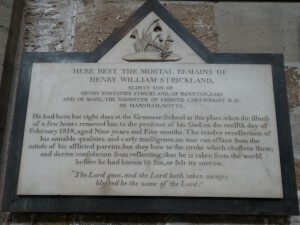 Tradition has it that a black servant rescued one of the family from drowning. 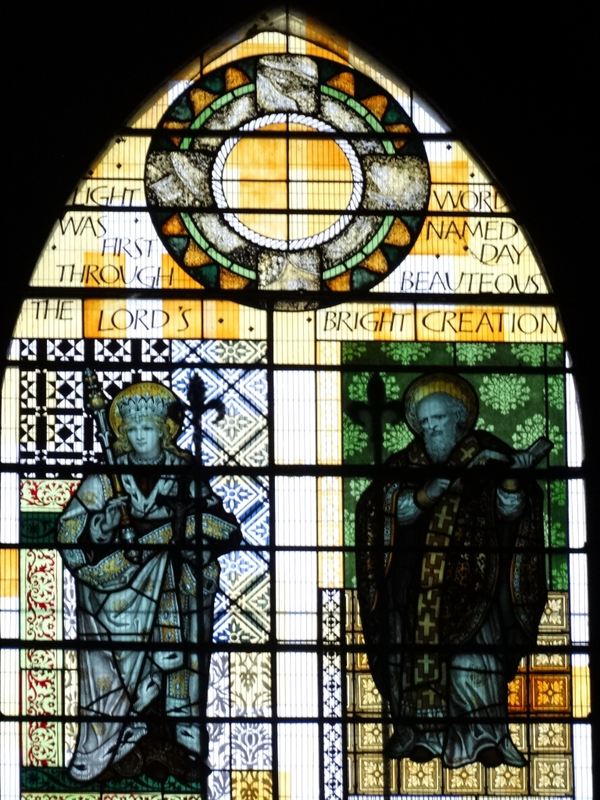 This window is dedicated to Samuel and Lucy Wuse, by Burlison and Grylls, 1886. 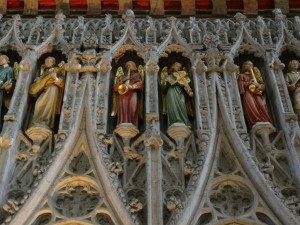 It shows the Ascension, along with Samuel the Old Testament prophet and St Lucy. 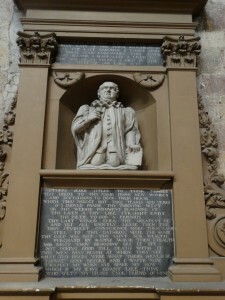 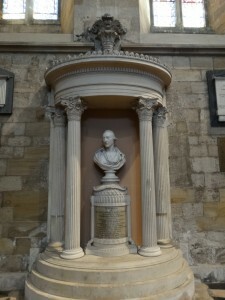 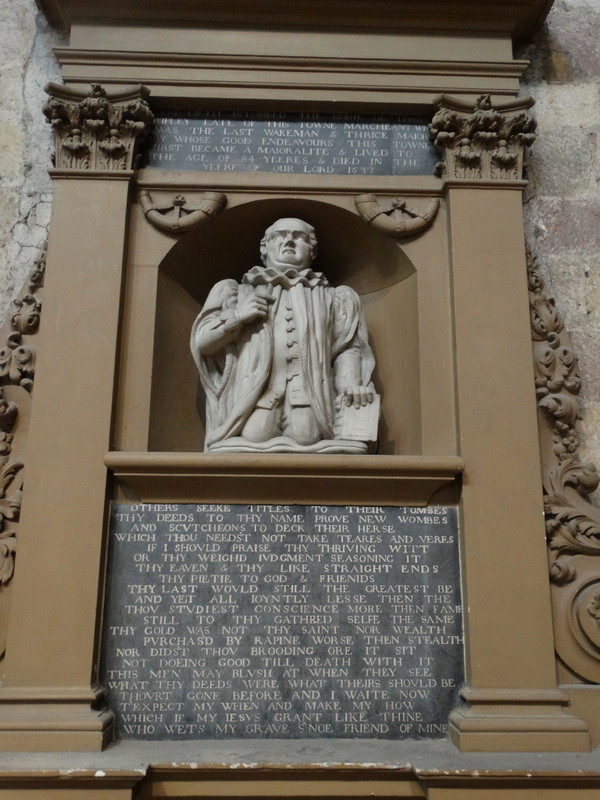 Samuel Wise was secretary to the first three Bishops of Ripon. 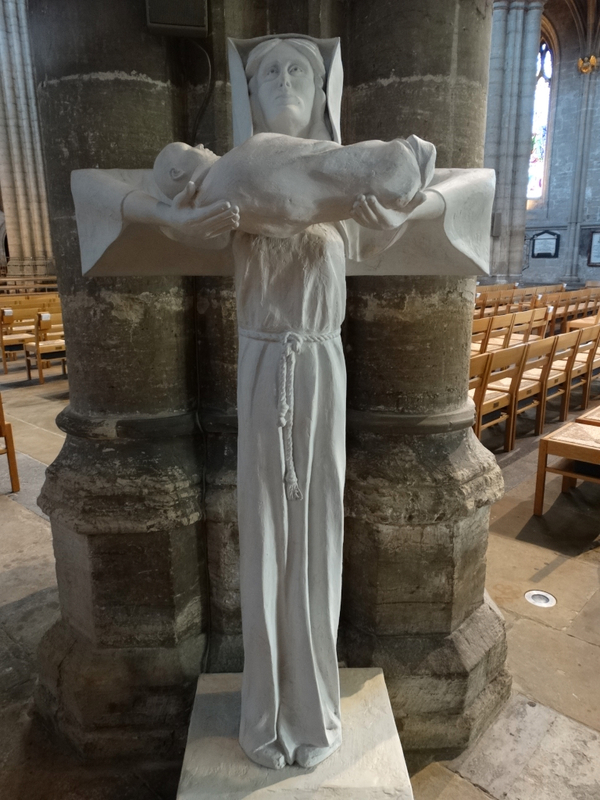 This Madonna is by Malcolm Brocklesby – Madonna and Child with the Cross. 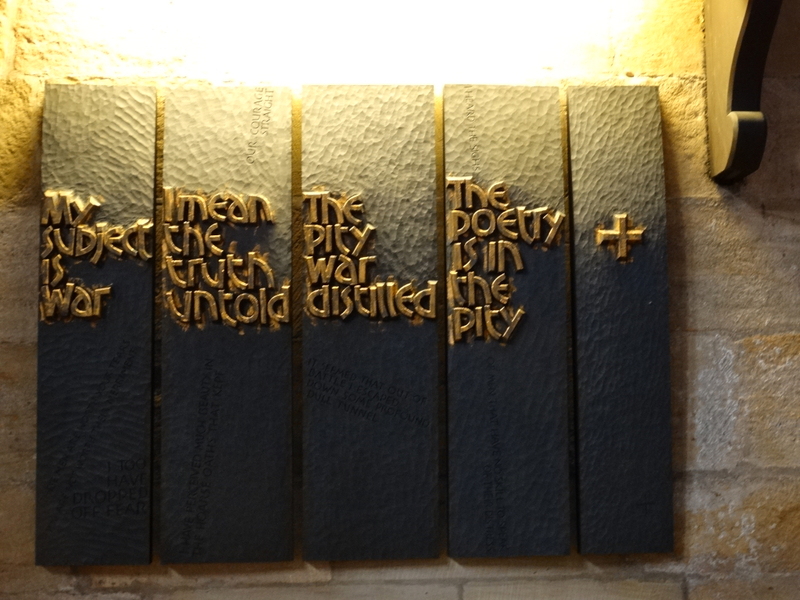 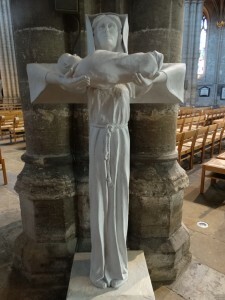 I think there is a similar one at Mount Grace Priory, English Heritage, and you walk up behind, just seeing the cross – you don’t get the same impression here when it is against a pillar. 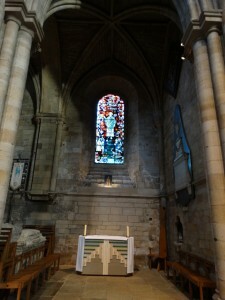 At the west end of the Nave is the Chapel of Justice and Peace. 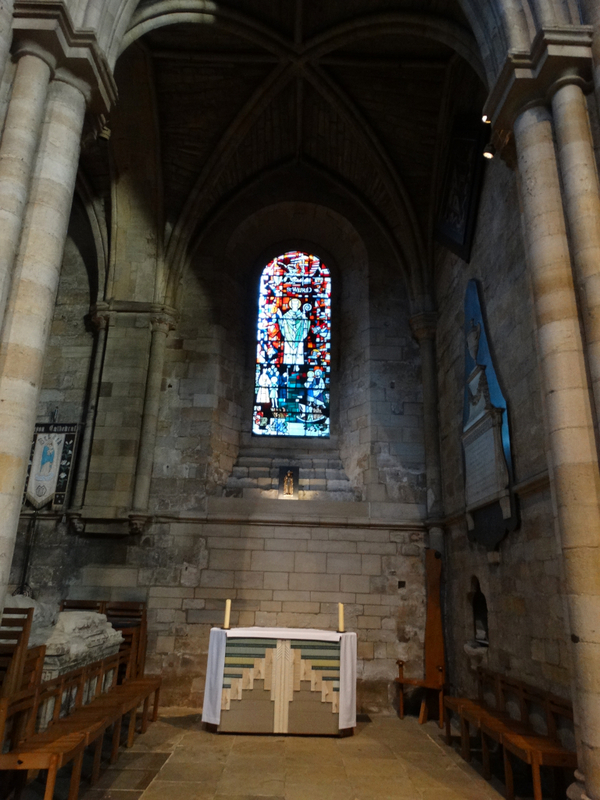 This was the area where the Consistory Court met, so Christ is portrayed as a judge. 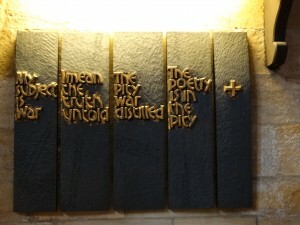 He bears the marks of crucifixion, so is also the bringer of justice and peace. 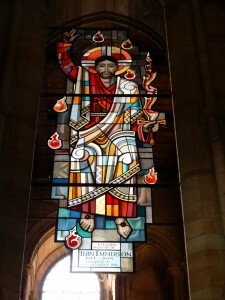 The flaming lamps represent the gifts of the Holy Spirit. 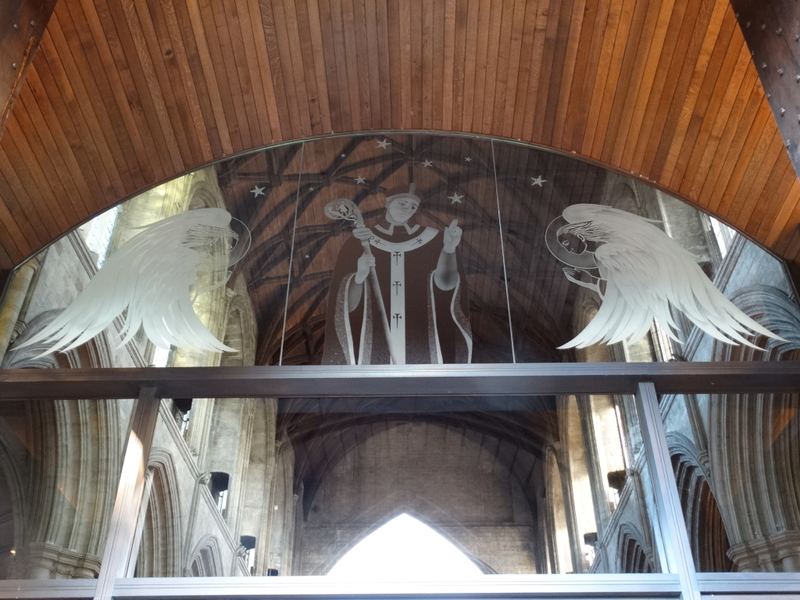 The hanging glass – it is not a window as it is inside the Cathedral – is by John N. Lawson of Goddard and Gibbs, 2005. 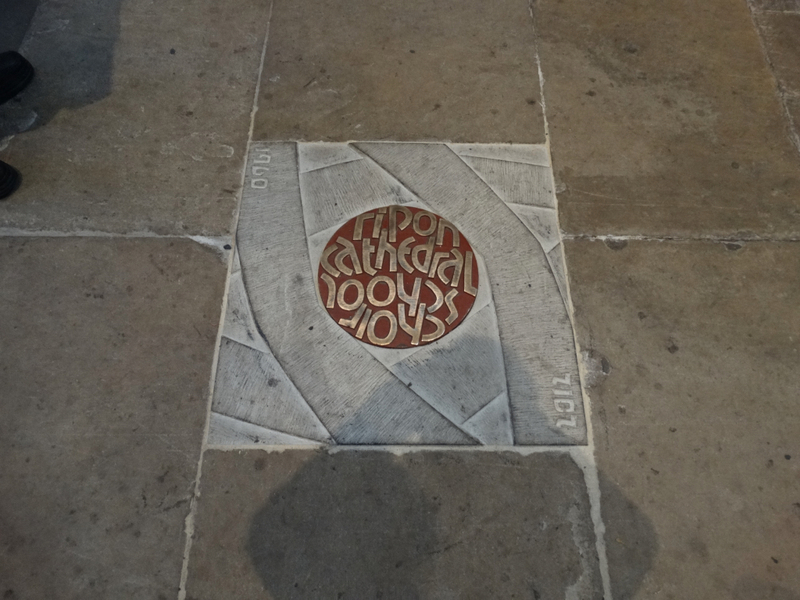 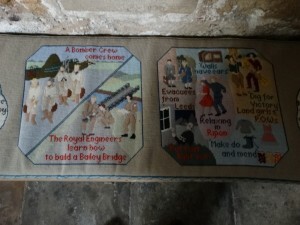 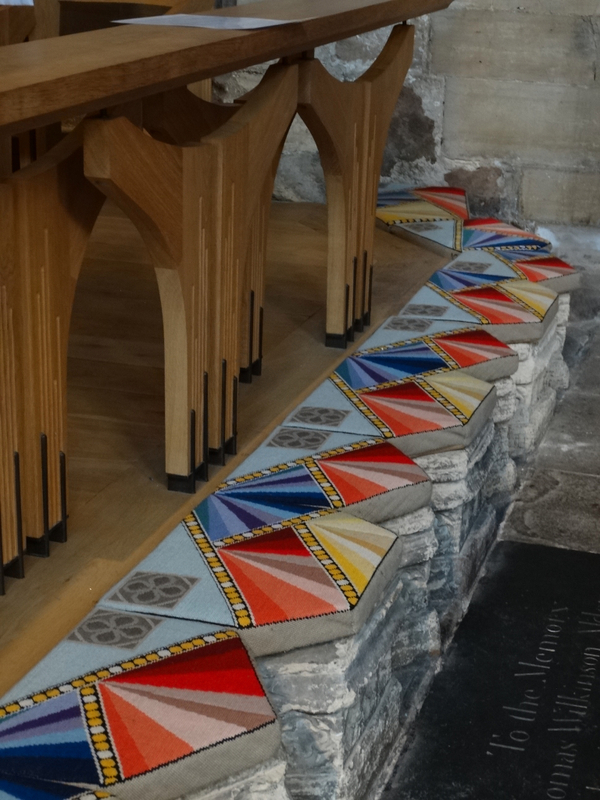 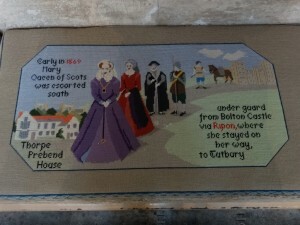 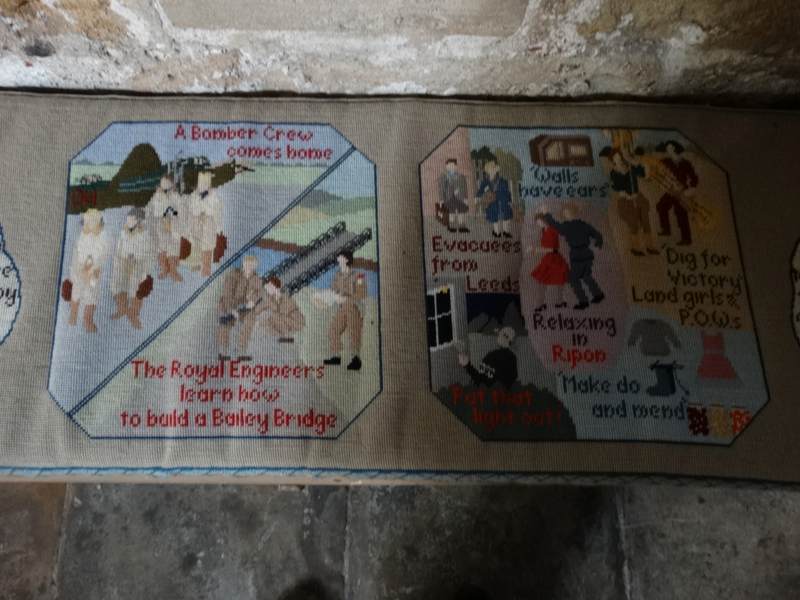 The kneelers are beautifully arranged along the stone – which gives me an opportunity to finish the western end of the Cathedral by including some of the lovely Millennium kneelers.